The Phoenix Hall of Byodoin Temple is a famed structure that was built around the first year of the Tengi Era (1053). Paintings on its doors and pillars are also a treasured part of the history of Japanese paintings. Behind the Seated Amida Nyorai (Amitabha Buddha) statue, the temple’s principal Buddhist image, are 2 doors to the entrance to the rear corridor from the west side of the main hall. The paintings on these doors depict Nissokan as described in the Kanmuryojukyo [“Sutra on the Contemplation of Buddha Amitayus”]. Although much of the paint has peeled off and the paintings were retouched a number of times in later centuries, the paintings are important because they have retained the major elements of their composition since they were originally created. The foot of the left door has a flush bolt that locks when the bolt is dropped into a hole in the doorsill. 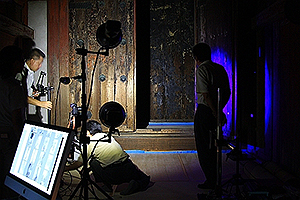 The lock’s wooden support is shaped like an “エ,” obscuring part of the painting. In conjunction with work to restore the Phoenix Hall, this support was removed, revealing the part of the painting that had been obscured. At the behest of Byodoin Temple, an optical study primarily of this portion was conducted. The study took place over 3 days from Sept. 4–6 and was done by HAYAKAWA Yasuhiro of the Center for Conservation Science and Restoration Techniques and SHIRONO Seiji and KOBAYASHI Tatsuro of the Department of Art Research, Archives, and Information Systems. Little pigment remains in what is thought to be the original portion of the painting behind the flush bolt. However, traces do remain. HAYAKAWA submitted these traces to X-ray fluorescence analysis while SHIRONO took high-resolution images, near-infrared reflectance images, and fluorescent images of these traces. Plans are to soon analyze and examine the data obtained and then publish those findings.